Anchor Brewing has always had ties to the ocean, having brewed beer in “the city by the bay” for 120 years. While there’s no written record of how Anchor got its name, it’s assumed that it came from brewing in a city surrounded by ocean where much of the culture and economy revolved around the ports. Fast forward 120 years and we’re celebrating those ties by collaborating with the Monterey Bay Aquarium. While Anchor may have an affinity for the ocean, it turns out some of the folks at the Monterey Bay Aquarium have a love for beer! There’s a group of employees who are passionate and active in the homebrewing community and asked Anchor to create a collaboration beer, which we happily agreed to. 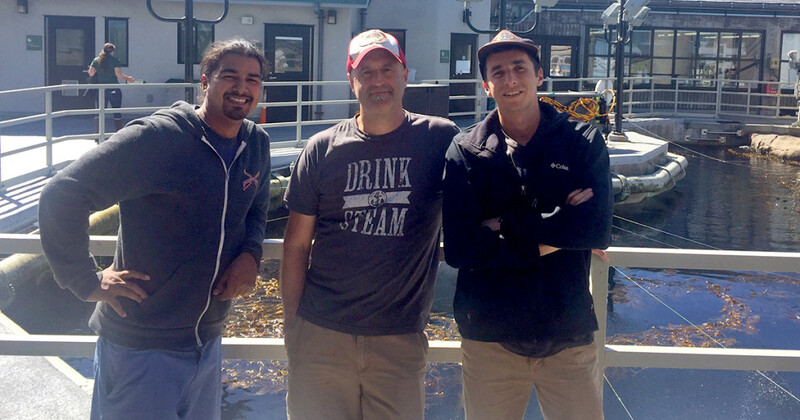 The Monterey-based homebrewers traveled up to Anchor Brewing in San Francisco. They shadowed our brewers working production and met with the brew team to discuss ideas for the collaboration beer. There were a ton of ideas thrown around, but the group was able to narrow it down, coming up with a beer everyone had a hand in. 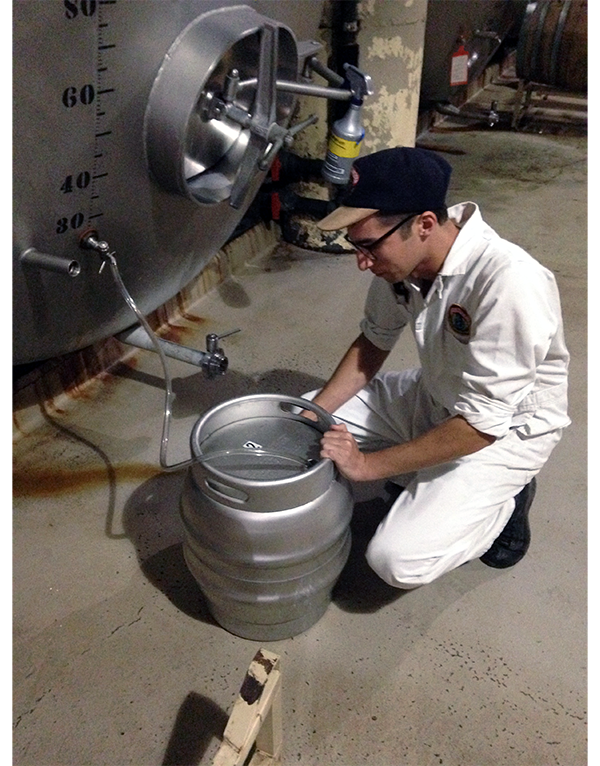 The collaboration beer is a cask, or firkin, ale dubbed Squid Wrangler Stout. During the brewing, we added a dash of briny sea water to this heavy hitting stout to create a flavor profile comparable to fine salted chocolate truffles. An addition of squid ink late in the brewing process contributes a dark, earthy complexity making for a truly enigmatic brew. The cask of Squid Wrangler Stout will be tapped at our Marine Brewology event at the Anchor Beer Garden this Friday, 10/14. 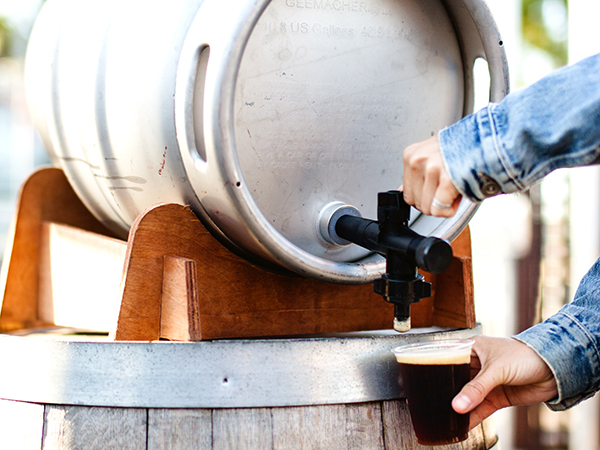 Gather around for the tapping of the firkin and learn more at the Brewers Cove. There will be a Beer Education Station featuring the ingredients used for guests to see/touch/smell and brewers to talk about the brewing process. While enjoying your Squid Wrangler Stout, play the Aquarium’s version of corn hole – coral hole. We’ll be pouring until the cask runs dry so come early and get some grub at Bel Campo or Creperie Saint Germaine. The Anchor Beer Garden is a dog and kid friendly space. The homebrewers of the Monterey Bay Aquarium were kind enough to host our brewers at the aquarium. 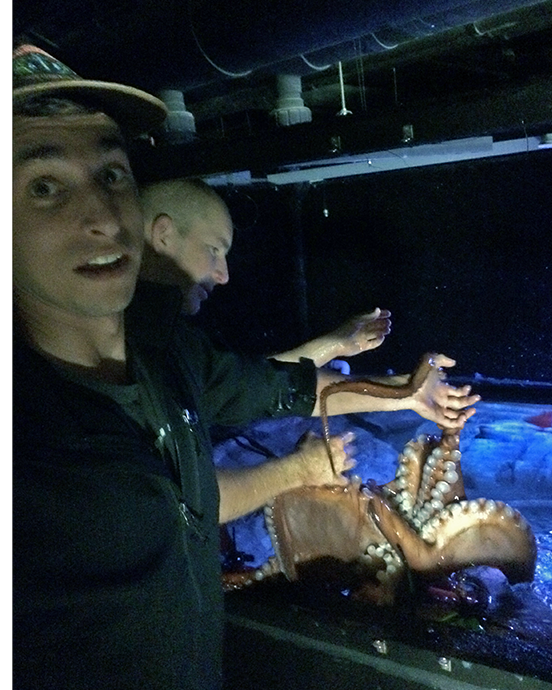 They learned the ins and outs of the aquarium and even helped to wrangle an octopus! How long have you been home brewing, and what inspired you to start? About 10 years. I’ve been a craft beer geek for a long time. I started when a friend was brewing for his wedding and offered to teach me. After the first time I brewed I was hooked. I love brewing, but what I love more are the stories shared and created during the entire process. What’s your favorite beer you’ve ever brewed yourself? Recipe-wise, my Belgian white ale. Story-wise, I brewed a vanilla stout with my dad. We used water from a spring in the Sierra Nevada Mountains where he and his dad used to collect water while hiking in the back country. I brewed the batch when I taught my dad and daughter how to brew. What’s your favorite Anchor beer? As a beer geek, you have to love Anchor Steam, it¹s a classic and there’s a lot of history. Odeprot IPA is pretty darn good too though. I’ve been brewing since I was 16 years old, when I used a brew kit my older brother did not want. I like the process of creating something of my own that I can’t find elsewhere! I brew a beer called 19th Hole which was a great post-activity, leisure beer when you’re ready to sit back and relax with a brew. 10 years. Initially, it was something I could do with my dad and father-in-law, then turned into something I felt was cheaper than buying commercially available beers. Being a broke college student, I naively ran some numbers on ingredient prices and thought, “Hey! 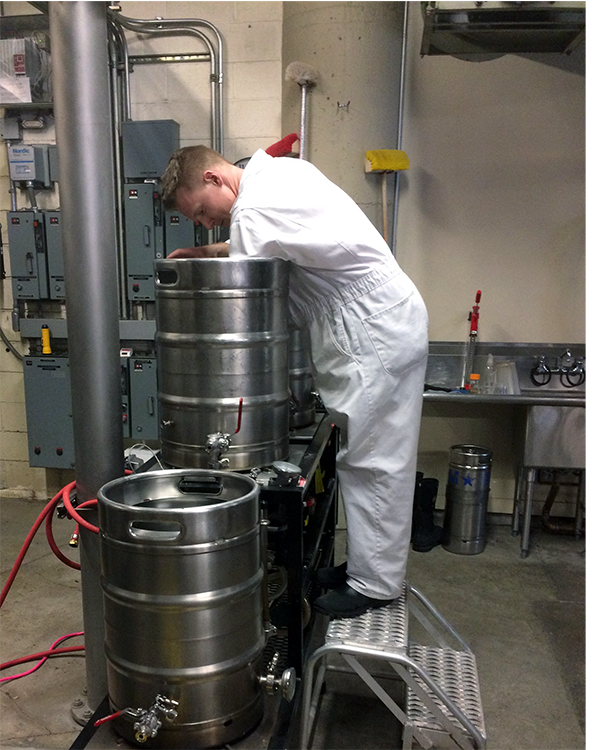 Each beer I brew only costs me like 30 cents!” What I failed to take into account is how expensive brewing equipment is. A Black IPA that beat Kevin and Justin’s beers in a homebrew competition we had a few years back!